In this moment, at the risk of seeming opportunistic, I want to tell you about a special concert coming up that has everything to do with immigration and the power of cultural synergy. The Either/Orchestra has been playing the music of Nerses Nalbandian for six years. Our CD, "Ethiopiques 32: Nalbandian the Ethiopian," will be coming out in March, and on February 19 we'll be celebrating Nalbandian at the Mosesian Theater of the Arsenal Center for the Arts in Watertown MA. Who's was Mr. Nalbandian? An Armenian, born in 1915, whose family, fleeing genocide, passed through Aleppo among other places. In 1938 he was invited to Ethiopia by his uncle Kevork, who had been working there as a music teacher and band leader for several years. Kevork was hired earlier by Emperor Haile Selassie, who wanted to employ Western-style military bands. Over several decades Nerses rose to become the first music director at Selassie's national theater, and among other things wrote the original anthem for the Organization of African States (now the African Union). He brought knowledge of European music, Armenian church music, and his wide open ears to Ethiopia. Incorporating American jazz, pop and Latin music into the Ethiopian sound he helped set the stage for the phenomenal Ethiopian music of the 1960's and 70's. He was a refugee and an immigrant. Our concert will include music by Nalbandian which has remained mostly unplayed for decades, except by us. As an added feature, we will feature music by three of his major inspirations: the Armenian composer Komitas, the first big Latin star in the US, Xavier Cugat, and Ray Charles. Our ten-piece band will be augmented by four wonderful singers: Bruck Tesfaye of Debo Band, Serena Tchorbajian, Manolo Mairena and Ronald Murphy, singing in Amharic, Armenian, Spanish and English, respectively. A pre-concert talk will be delivered by French-Armenian scholar Boris Adjemian. When I say this will be a unique event, I'm not exaggerating. It will be a celebration of what happens when people cross borders of every kind: geographic, political, ethnic, cultural. This process is the story of the advancement of humanity. The theater is small, so I recommend buying tickets well in advance - and the concert is only three weeks away. Founded in 1985 by saxophonist & composer Russ Gershon, the ten-piece Either/Orchestra, based in Somerville MA, is one of the jazz world's most long-lived and distinguished groups. Alumni include jazz stars such as John Medeski, Matt Wilson, Miguel Zenon, Jaleel Shaw & Josh Roseman. 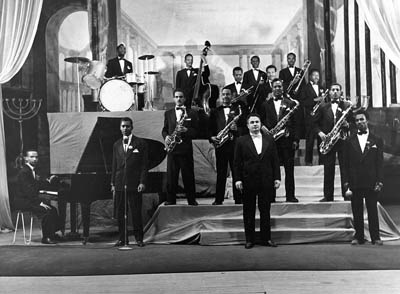 The E/O, featuring a six piece horn section, piano, bass, drums and congas, has put its stamp on just about every style of jazz, from big band, swing and bop to Latin jazz, electric and avant-garde. The last decade or more has found the band absorbing an Afro-Caribbean influence through a succession of Latino members. More unusually, the E/O has become deeply involved with Ethiopian music, touring there and collaborating with many Ethiopian greats of the outstanding 1960's generation. Mulatu Astatke, Mahmoud Ahmed and Teshome Mitiku are among the band's favorites. The Ethiopian connection includes the double CD Ethiopíques 20: Live in Addis and the DVD Ethiogroove: Mahmoud Ahmed and Either/Orchestra. Over the years, the E/O has been recognized with five Boston Music Awards, perennial placement in the Big Band category of the Down Beat International Critics Poll, and leader Gershon was nominated for an arranging Grammy for his composition "Bennie Moten's Weird Nightmare," included in The Calculus of Pleasure. At either-orchestra.org you can link to music samples and internet stores, find a complete discography and further information.